While I'm still searching for a VW 411 or 412, it's not too hard to find a Type III wagon on the island. Here's a pretty straight original-owner '73, spotted in the same South Shore neighborhood seen in Robert Bechtle's painting, Alameda Gran Torino. While I was shooting these photos, the owner emerged from his house to tell me the story of the car, which has driven across the country many times in its life. He had a couple of disassembled Type IIIs, plus tons of parts, sitting in the garage. 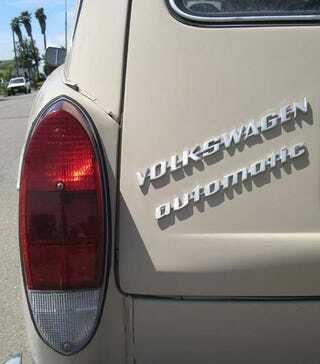 "The best car VW ever made!" He gets regular offers for this one, but he's not selling. I don't blame him. The Type IIIs tended to suffer from the occasional overheating problem, since all the cooling air had to be drawn in through these side vents. For '73, the engine was a fuel-injected 1600 that clattered out a perfectly adequate 54 horses. Even with the missing hood ornament, this is one of the cleanest original street-driven Type IIIs you're likely to see. Of course, the owner is in his 80s and doesn't put a lot of miles on it. The lack of body rust is impressive; while cars rust slowly here, air-cooled VWs manage to work oxidation miracles in dry climates. The automatics are pretty rare, no doubt because the godawful "automatic stickshift" trans used in 60s Beetles made an entire generation of car buyers distrustful of any VW with the word "automatic" anywhere on the car. This car's owner says the slushbox in his car has never had a problem.